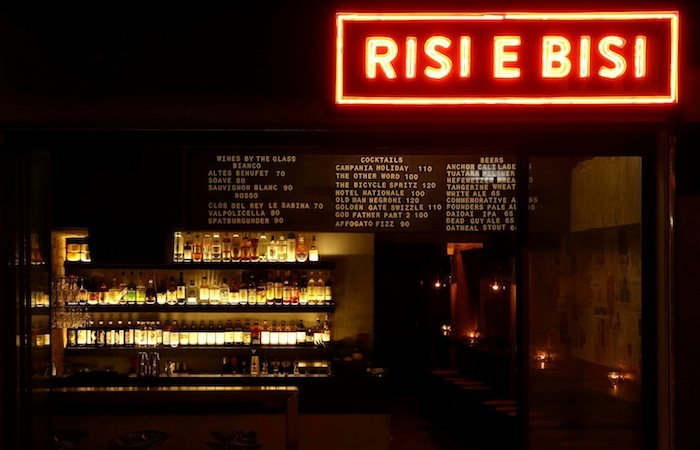 RISI e BISI pays homage to traditional Italian food in a low-key setting in Soho, Hong Kong. 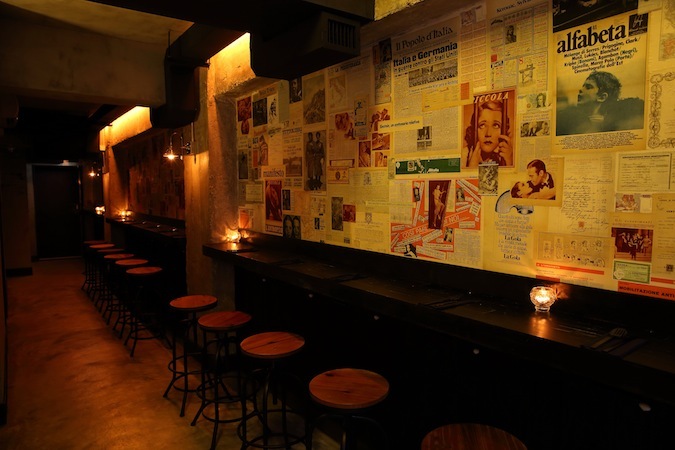 RISI e BISI pays homage to traditional Italian neighbourhood bacaro bars with a casual ground floor bar of exposed brickwork, distressed metal and leather furnishing, vintage Italian newspapers on the walls, and some of the tastiest food we have had in a while. Served alongside boutique beers with enthralling stories and cocktails that have evident creativity poured in with each shot of liquor, we find this new Italian hotspot pretty sweet. Venetian wine bars have come in a steady wave these past few months, but doing the theme well has seemingly proved to be a challenge. What Risi e Bisi do is set the customer at ease in an uber hip environment, coupling the extensive drinks menu with signature pasta, seafood and meat dishes sourced from the best available local and regional produce. 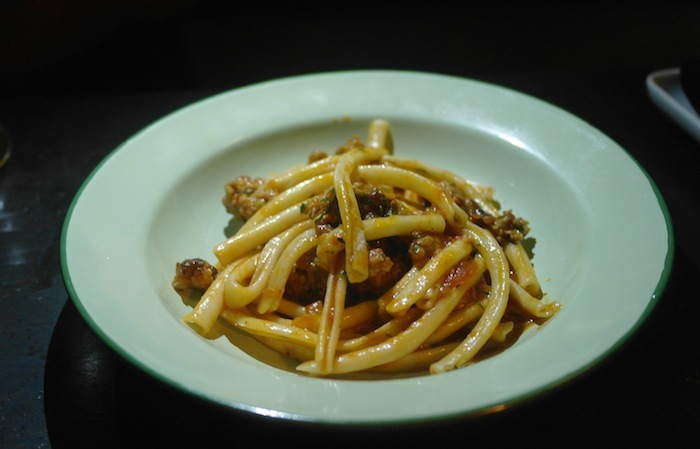 Dishes range from the signature RISI e BISI (Italian style rice and peas) with braised pork, Poh Poh’s Carbonara with 63° egg, and Strozzapretti pasta with chilli Nduja and housemade Sausage. The darker ambience is very chilled out and Irish manager Michelle is an ideal host, as she guides you through the variety of boutique beers that are boastfully flavoursome and have some beguiling tales. 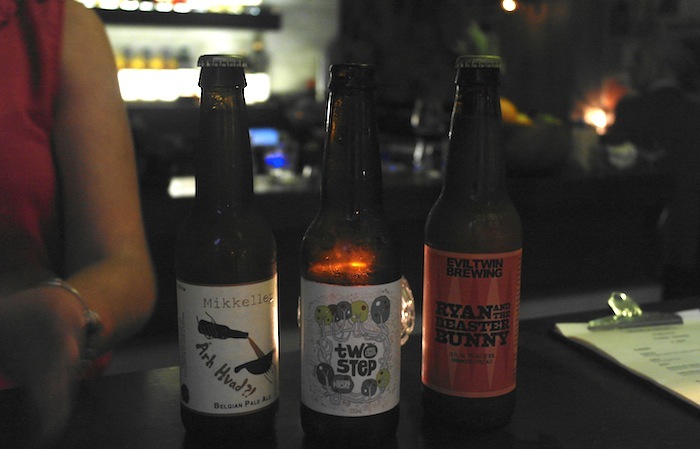 Ask about the Evil Twin beer, and the subsequent stock of Two Step Apple Cider by Mountain Goat (which is great by the way; as cider snobs, we found the balance of sweet and dry at optimal levels in this Australian brew). The first indicator of the tastiness of what was to come, presented itself in the form of the unassuming housemade lobster and seaweed crackers ($50). A far cry from the greasy, overly pungent prawn renditions you acquire when ordering takeaway thai, these are thin, light and crispy, with a pronounced lobster and seaweed taste, making them amongst the yummiest rice crackers we have ever had. Well worthy of a mention! On to the fried Scarmoza ($55), that as an aside, is a great vegetarian bar snack (a category oft overlooked), which is a pulled cow’s milk curd cheese that resembles mozzarella. While mozzarella is eaten fresh, however, scamorza is hung to dry until it achieves a soft yet firm texture, and then fried. This was delicious and chewy with a subtle smoky flavour. 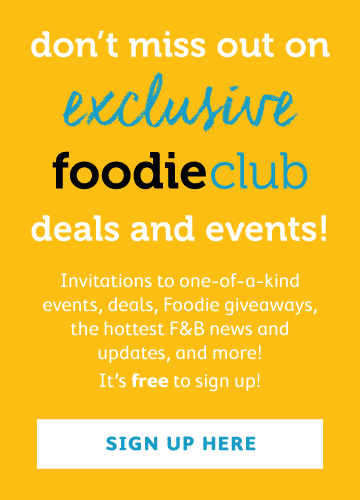 We would liken it to an Italian halloumi! Next was rocket and parmesan wrapped in bresaola with a wedge of lemon. Simple, tasty. 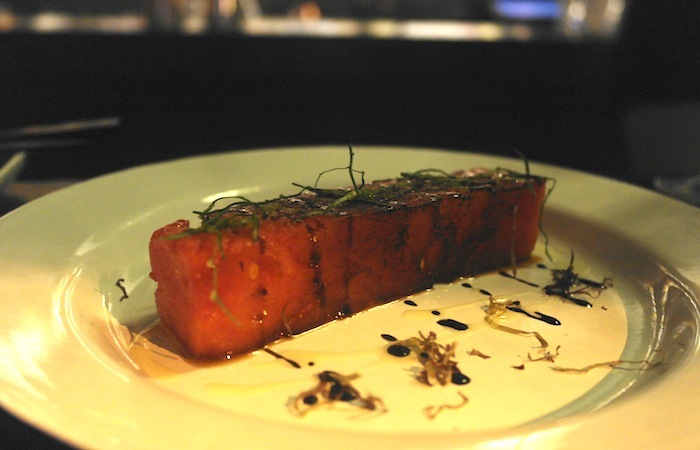 A grilled watermelon with basil and vincotto followed that even these warm-watermelon haters found most enjoyable! The watermelon must have only touched the grill at a high temperature because there was such firmness to the fruit, as well as the charred taste that grilling lends. Basil injected a fresness and the vincotto married it all very nicely. The PORK though ($120)! …what a dish. This is a 72 hour pork rib (actually they take 96 hours to prepare it but 72 sounds better) that goes through a dry marinade, a wet marinade, two types of cooking and then lands on the plate with an aroma that nearly caused us to fall off our chairs. The flavour of this dish is other-wordly, and the texture of the pork that has undergone such an extensive process is pull-off-the-bone-with-a-fork type tender. The spice rub remains undisclosed, making it a captivating menu choice that we are dreaming of still. In all honesty if you come only to eat this you would leave a very happy camper. Working masterfully in taste with this was the Campania Holiday ($110) which is like a caprese salad in a cocktail. Weirder to explain than in flavour, it is made with a clever mozzarella-fat washed Aylesbury Duck vodka, rosemary tomato syrup, fresh lemon juice, and fresh basil leaves. Most balanced in savoury and sweet, this was our favourite beverage of the night. Strozzapretti pasta with homemade sausage ($120) reared its mouthwatering head, made with chilli Nduja (a sort of pork lard), this is deeply savoury dish that is fortified by the hand made pasta, cooked perfectly al dente, with the noodle in a shape that retains the sauce in its hollowed tubes. Meatballs ($80) were classic and in Italian style, with a lovely Napoli sauce and crispy bread. They were ever so moist and seasoned flawlessly. 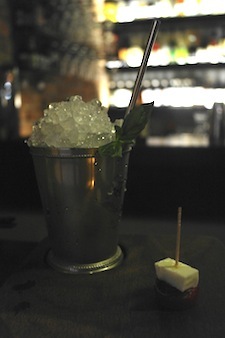 The liquid fortification to accompany was the Golden Gate Swizzle ($110) which features Fernet Branca, lemon juice, orgeat, angostura bitters, and Falernum. It is reminiscent of Chinese medicine and while that doesn’t sound as appealing as say, a negorini, the flavour balance is spot on and it is a really refreshing drink. Poh Poh’s Carbonara with a 25 minute cooked 63° egg unequivocally was the show stopper. Carbonara is rarely cooked in the authentic Italian way; devoid of excessive cream and championing of the ‘rare’ egg whose yolk should burst forth to coat the pasta and provide the sauce. This is precisely what head chef ­­­Poh Poh has achieved in her gorgeous carbonara, with salty parmesan and crispy pancetta atop of the chewy spaghetti. The beurre-blanc is the simple base that has a hint of bayleaf providing for a court that surrounds the egg as king, which when you cut through, flows all its yolky goodness out over the thin strands of pasta, making for a lip-smacking bowl. We didn’t share any of this one. The last meal tried was the veal milanese, with rocket and lemon. Whilst tasty, it didn’t bestow even half the grandeur of its predecessors. We were glad for the RISI’s Whisky Sour $120 though, making its statement with the housemade malted beer syrup, lending great drinkability to an otherwise potentially harsh cocktail. We really enjoyed it! The Verdict: Risi e Bisi is superbly on point. The prices are very low given how high quality the food is, even if the portions are only bar size rather than a la carte. One might require multiple orders to really fill up. 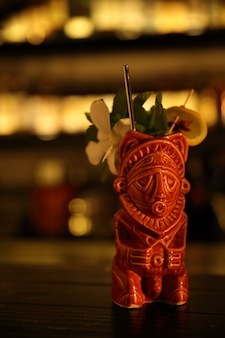 The drinks are creative and mixed well (ask the bartenders to exhibit a ‘zombie shake’; its highly amusing and rather unusual), with adroit ingredient combinations that are fresh and couldn’t go better with the cuisine type. The food is seriously scrumptious, and we would be happy to come here again and again because of the acute yum factor in all of the dishes. For a drink after work or casual date night or family dinner, we think Risi e Bisi is one of the better choices you can make. 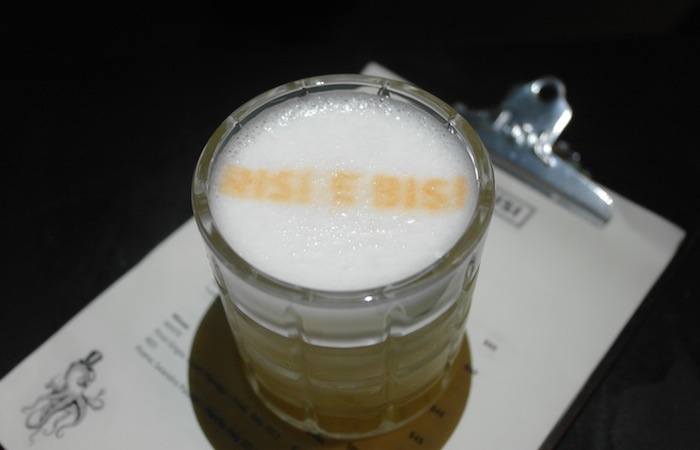 What’s certain is newly opened Risi e Bisi is doing casual Italian deliciously!